Arick was born and raised in Superior, the middle of 5 children. The family attended the Superior Church of Christ, and he was baptized into Christ in April 1993, before they moved to Clay Center in 1999. Arick graduated from Clay Center High School in 2001. 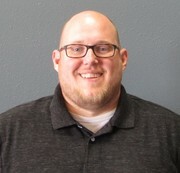 Arick was selected as a Timothy of Clay Center Christian Church, enabling him to attend Nebraska Christian College (NCC) to prepare him for full-time vocational ministry. He met his wife, Kacy, at NCC. They married in Council Bluffs in 2004. After interning with the senior adult ministry for a year at First Christian Church in Council Bluffs, Arick graduated in 2007 with a Bachelor of Arts in Pastoral Ministry and a Bachelor of Theology in Family Life Ministry. Arick has served the Church in a variety of roles as Pastor in Ellensburg, WA; Youth Pastor in Beloit, KS; and Campus Pastor with CSF at the University of Nebraska-Kearney. Arick is passionate about preaching and teaching, making disciples, and leading the church in worship. Arick and Kacy have been married for 13 years and have 3 wonderful children named Mason Blaine; Jubilee Rae; and Gunnar Nikolaus. Arick enjoys spending time with his family, playing guitar, hunting, fishing, cooking, and reading. Sharon grew up in Clay Center and has spent most of her life here. She and her husband, Rodney, live in Clay Center with their daughter, Sydney. Sharon has been on staff at Clay Center Christian Church since 2012. In her free time, Sharon loves spending time with her family and friends and loves to read. Rita gew up on a farm in the Pauline area, graduated from UNL, and now lives in Fairfield with her husband Mike and their 3 children: Rachel, Emily, and Nathan. In addition to serving Clay Center Christian Church, she works part-time as a journalist at Clay County News. She has been writing professionally for more than 20 years. Besides writing and photography, which are as much a hobby as a job, Rita loves reading, music, stretching her mind, and spending ample amounts of time with her family, friends, and pets.